In essence their murders could have been prevented. The #DeadWomenWalking march aims to raise awareness of the women behind the statistics of domestic violence murders. It is a peaceful, creative ‘Murder March’ to remember and represent the women murdered in the UK by partners, ex-partners and family members. 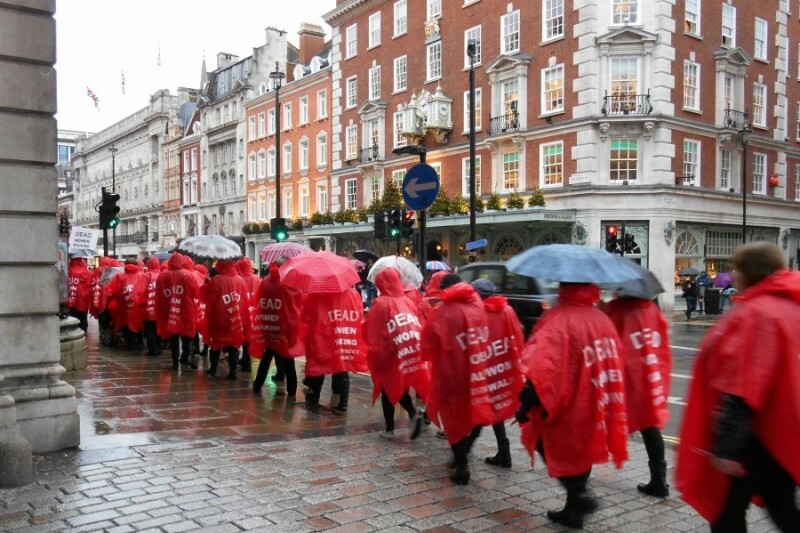 Last year the first #DeadWomenWalking march went to Downing Street to raise awareness of domestic violence murders. It was a respectful, artistic march where women walked in silence in red ponchos and carrying a candle with the name of a murdered woman on, and the names and ages of the 400+ women who had been killed since the election were read out loud. This year #DeadWomenWalking are marching to Parliament Square on 22 November 2015 at 2pm. The march is being organised by Claire Moore, the co-founder of Certain Curtain Theatre Company, a small scale, unfunded, professional touring company specialising in new writing and established in 1989. Since 1995, the Certain Curtain Theatre Company has been deeply and passionately committed to using compelling, original theatre to combat the complex issues of domestic violence and its impact on women and their children. Performances take place in community centres, school halls, prison – any space that can be turned into a ‘theatre’ for a few hours – and are linked in with local support agencies to provide face to face advice and a platform for exploration, discussion and understanding of the plight of victims of domestic abuse. The idea being that if we can change attitudes we can change everything. As part of the performances the Certain Curtain Theatre Company has a display of media coverage of domestic and sexual violence to highlight victim-blaming reporting, the lack of including domestic violence helplines and the lenient sentencing of perpetrators of male violence against women. But the headlines and media coverage are nearly always about the killers, their mental illness, their stressful job and the names of the women they had killed rarely made the headline or front page news. So seven years ago Moore decided to include a list of the names of women killed along with their age and date they were killed, to show that the women behind the statistics are real women of all ages, cultures and class and had a name. Listing these deaths and researching their stories you see – you really see – how little women’s lives matter. Time and time again we see that the women killed, murdered, have been failed – we see that the warning signs were missed, or not acted upon, they were not believed; in essence their murders could have been prevented. Domestic homicide reviews are published and then comes the same statement we have all heard far too many times: ‘Lessons will be learned’. So when will women’s lives matter enough? These women should be walking, but they’re not, because we let them down. We women are more likely to be raped, beaten and/or murdered by men we know than by a stranger – one in three of us will experience domestic violence and so just as the phrase ‘dead man walking’ means ‘someone who is about to die’ we are all dead women walking. Because until those lessons really are learned and women’s lives are valued, statistically we are joining this too long list. Together with the ICChange campaign #DeadWomenWalking is calling on the UK government to get serious about ending violence against women, by ratifying the Istanbul Convention. The UK government signed the Istanbul Convention to end domestic violence and male violence against women on 8 June 2012 – we are calling on the government to complete the process and ratify it now. If you haven’t signed the ICChange petition yet, please do. To sign click here. To join the march – or if you want to help by being a steward, click here. And there is a GoFundMe page for this year’s #DeadWomenWalking event – please support and share if you can.